Product prices and availability are accurate as of 2019-04-15 01:28:48 EDT and are subject to change. Any price and availability information displayed on http://www.amazon.com/ at the time of purchase will apply to the purchase of this product. Using your ideal combination of printed text and online resources, learn Corporate Finance YOUR Way with CFIN5! This easy-reference, paperback textbook presents course content through visually engaging chapters as well as Chapter Review Cards that consolidate the best review material into a ready-made study tool. 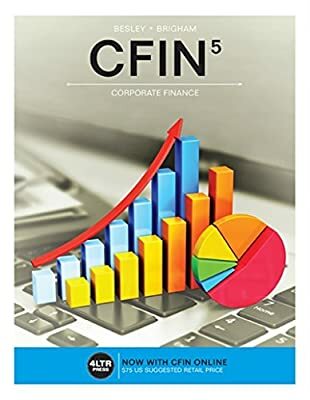 With the textbook or on its own, CFIN Online allows easy exploration of CFIN5 anywhere, anytime--including on your device! Collect your notes and create StudyBits™ from interactive content as you go to remember what's important. You can use preset study resources or customize your study tools through easy-to-use tags and filters to prioritize--and maximize--your study time. With Concept Tracker, you can also make and review flashcards, review related content, and track your progress--all in one place and at an affordable price. Add in access to assignments and documents from your instructor, and you have everything you need in one place that's always accessible!